Stepping Stones Museum for Children will be hosting its 3rd annual FriendsGiving fundraiser on Thursday, Nov. 8 at its iconic facility in Norwalk’s historic Mathews Park. Proceeds from the event will support the museum’s Open Arms initiative. Photo courtesy of Heather Prescott Photography. 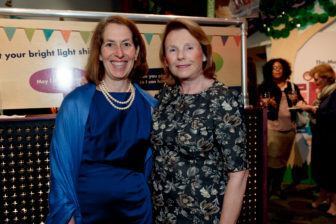 Stepping Stones Board Chair Sandra Miklave and FriendsGiving Event Chair Kris Granetz enjoying last year\’s event. The festive fundraising fete brings together friends old and new for an enjoyable evening featuring a special signature cocktail, hors d’oeuvres and networking hour beginning at 6:30 p.m., followed by an intimate harvest dinner, based on a Thanksgiving-inspired menu from Marcia Selden Catering and Events at 7:30 p.m.
At the heart of Stepping Stones Museum for Children is an unwavering commitment to inclusion. Open Arms Accessibility Initiative, which provides thousands of children, caregivers and teachers each year the opportunity to enjoy the museum regardless of financial, language, cultural or special needs barriers. FriendsGiving is made possible by Diamond sponsors the Foster Family Fund and Kris and Marc Granetz, Platinum sponsor Marcia Selden Catering and Events, Gold sponsor the Aiello Foundation and Silver sponsor First County Bank. Additional sponsorships are available and designed to celebrate and honor corporate and personal commitments to Stepping Stones Museum for Children. For information about opportunities, please contact Kristen Welton at 203-899-0606, ext. 207 or visitwww.steppingstonesmuseum.org/friendsgiving. 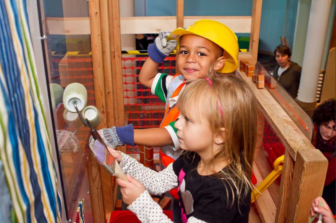 Stepping Stones Museum for Children is an award-winning, private, nonprofit 501 (c)(3) children’s museum. For more information about Stepping Stones, to book a field trip or schedule a class, workshop or facility rental call 203-899-0606 or visit the museum website. Stepping Stones Museum for Children is located at 303 West Ave., Norwalk, near Exit 14 North and 15 South off I-95. Museum hours are: Labor Day through Memorial Day, from Tuesdays through Sundays and holiday Mondays from 10 a.m. to 5 pm; and Memorial Day through Labor Day, from Mondays through Sundays from 10 a.m. to 5 p.m. Admission is $15 for adults and children and $10 for seniors. Children under 1 are free. Get social with Stepping Stones on Facebook, Twitter or Instagram. Stepping Stones Museum for Children commemorates the 90th anniversary of Mickey Mouse with a week full of animated activities from Nov. 17 to 25, including stories, games, and dance.